Jenny Lawson is hilariously damaged. I don't know how else to describe it. 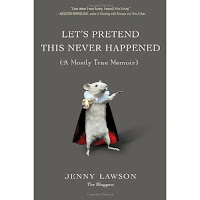 She shares a lot of stories from her childhood and how growing up with a father that brought home animals (alive or dead) has given her an appreciation for taxidermy (hence the stuffed mouse on the cover). A good portion of the chapters come straight from her blog so I was a little disappointed that it wasn't all new to me. I didn't exactly mind re-reading old blog posts because they are still funny the second time around, but for $12 (kindle) I was expecting new material that I couldn't find for free on the interwebs. Even with that, I still enjoyed her (mostly true) memoir. I had moments where I laughed out loud and made my husband look at me like I'd lost my mind. That's how you know a book is funny... people look at you strange when you're reading it. Happy (end of) Banned Books Week!